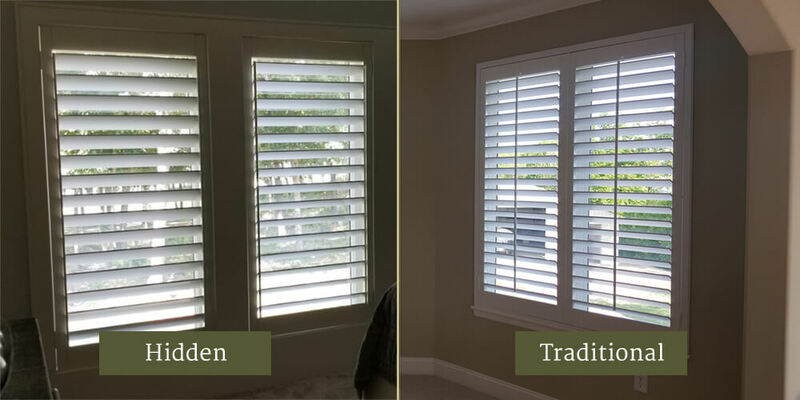 Selecting the right type of tilt rod is one of the first decisions you make when selecting new plantation shutters for your home, and there are two primary types to choose from – traditional tilt rods, and hidden tilt rods. The tilt rod is a critical component of the shutter panel, as it is what allows you to control the angle of your louvers, and thus adjust the light and privacy levels in your room. The type of rod you choose can also impact the overall design aesthetic of your room, with traditional rods providing a more classic and traditional look, and hidden rods providing a more contemporary presentation. Traditional tilt rods are installed on the front of your shutter and run down the middle of the panel, allowing you to set the angle of the louvers to your liking. While this is the most common of the two options, its market share isn’t as large as it was in previous years. They offer a classic presentation, and are an obvious choice for more traditional style shutters or if you prefer a more “vintage” look. Traditional rods are often the most popular features of a plantation shutter. They offer a simple elegance, and integrate nicely with refined or relaxed room decor. Traditional tilt rods are simple to operate. Continuous rod linkage can be installed for added durability. This consists of continuous aluminum linkage that is securely glued to the back of the tilt rod which provides extraordinary strength, and ensures that the louvers will not detach from the tilt rod. Some homeowners feel that traditional tilt rods can be visually distracting. Having traditional rods installed adds another vertical line to your window space. They are sometimes mistaken as the tool used to open the shutters away from the window. Hidden shutter tilt rods are less conspicuous as they are built directly into the edges of the window shutters. The only visible part o the rod is that which can be seen on the inside of the stile. This type of rod has become increasingly popular in recent years due to upgrades in both mechanism and appearance. For those with more contemporary room designs, this option adds to the beauty of the shutter and offers a clean, unobstructed view. Hidden rods look fantastic in a contemporary home, as they incorporate a clean, straight design aesthetic. This makes them ideal for homeowners seeking to modernize their home’s interior. They allow more light to enter the room, and provide an expanded view. Hidden tilt rods are designed to close tight at the ends of each shutter panel, thus eliminating unwanted light gaps. This tilt rod design may look out of place inside more traditional/vintage style interiors. Selecting hidden tilt rods may increase the costs of your window treatment project, as installing them requires additional labor. Ultimately, choosing the “right” shutter tilt rod is more a matter of personal preference, as opposed to what is correct or incorrect. As with any window treatment decision, be sure to consider all of the various elements that may be impacted by your decision, including style, functionality, cost, privacy, and light control. Learn more about plantation shutters by reading our Plantation Shutters Buyer’s Guide for 2019! Get our latest design tips, special offers, and professional advice straight to your inbox! How Much Do Plantation Shutters Cost? Rhonda Doyle has been designing and installing custom window treatments in the greater Kansas City area for nearly 20 years.